Every so often I have visitors from South Africa come to stay with me – usually family or close friends. One of the benefits of having said visitors is that sometimes they can be persuaded to mule some South African produce over the Atlantic for me. Any ex-pat saffa will tell you how awesome it is to be presented with treats such as biltong, Nik naks, Snacker bars, Strawberry Whirls, Klipdrift brandy and the like from our homeland and while I love all of these, my personal preference is for a bottle or two of fine South African wine. Anyway, about a month ago my sister-in-law and my little niece came to visit for a few weeks. By now, I’ve done the early morning Saturday breakfast run so many times that I’ve got it waxed so come 7:00 am, K and I were packed and en route to Heathrow to fetch them. It was great to see them again and spend some time with them and they were kind enough to bring me some awesome goodies from home: amongst other things, a parmesan-infused olive oil pressed in Cape Town, 2x Nomu spice rubs (delish!) and the pièce de résistance, two bottles of Cape Town’s finest. Now those of you living in the UK probably don’t think much of South African wine, and I don’t blame you. Generally, South African wine in the UK tends to be targeted at the £3-£8 niche, a “3 for £10” offer on a budget bottle of saffa vino a common sight in a UK supermarket. These, while drinkable, are unlikely to impress anyone who appreciates fine wine. While it is possible to find a quality bottle of SA wine in the UK, it usually means visiting a fine wine shop and paying over the odds for one and unless you’re familiar with South African wine, most people aren’t willing to gamble. Most people don’t know this, but South Africa has been producing wine for about 350 years. This is much longer than most countries designated as ‘New World’ and as such the wine produced is interesting in that it’s New World fruit, made mostly in the Old World styles. Cape Town, my home, is the heart of SA wine production with the oldest vineyards belonging to the Constantia region, just a few miles from my family home in Bergvliet (Southern Suburbs of Cape Town). South Africa, being a wine-producing country like France, makes a LOT of wine (not all of it good) and in fact it’s extremely rare to find a bottle of wine that’s not South African in any wineshop / bottle store in South Africa. Rather, you’d be presented with aisle after aisle of indigenous SA wine with everything from budget blends to high-end aged reds and old-vine whites. Anyway, the two bottles dutifully muled for me by my sis-in-law were picked out by my old friend, Fish, who runs Wasabi, a sushi / asian fusion restaurant nestled amongst the winelands of Constantia. I’ve known Fish for about ten years now and whenever I’m in Cape Town on holiday we catch the cricket together at Newlands, lord it up on the wine farms and eat out at the best restaurants as a matter of course. He often sorts out special bottles for visitors to bring over for me and on this occasion I asked him for a Semillon and an aged Pinotage (South Africa’s own grape). Fish is a restauranteur, all-round foodie and qualified sommellier, so when he sent me two bottles other than what I asked for, I trusted his judgement. 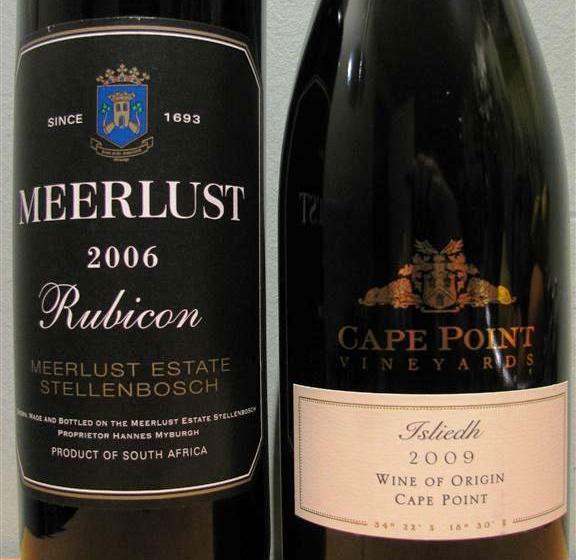 The first bottle he sent me was Meerlust’s Rubicon (2006), a truly iconic South African wine made from three varietals (Cab / Merlot / Cab Franc) in the Bordeaux style. The last bottle I had was a magnum (1.5L) of the 1998 vintage, shared around the Sunday dinner table with my mom, dad and brother a few years back. To have another bottle now brings back those fond memories and I can’t wait to share it with some good company. Now to think of some good food pairings… Suggestions? I quite enjoy the £3-£8 market which just serves to demonstrate what a barbarian I am! 😀 I’m not at all knowledgeable about wine but reading about your clear passion on the subject is quite inspirational. Excellent post, Gary. Your writing is so engaging. PS. Treats from home are the best! I try to make a point of getting to Bury Market for black pudding whenever I visit home. Thanks for the kind words. I think the problem with wine is that there’s so much choice in this country that it can become daunting to pick something out. It’s also expensive to experiment with and difficult to talk about without sounding pretentious. I must be honest and say that I’ve never actually tried black pudding. To be honest it sounds pretty grim but I’ll try anything once! Thanks for a fine blogpost!! Wonderful to see the Meerlust being shown in a positive light overseas. The Rubicon has done exceptionally well in past years, both locally and abroad with the odd award coming their way. [here falls in tatters my facade of wine knowledge]. Being your common or garden pleb, with a palate to suit I cannot make any erudite input, but offer the following two suggestions that seemed to find favour with guests. The first is a Venison Pie and a dab of fruit jelly, steamed veg and potato croquettes; and the second was a personal variation of Beef Wellington, roast baby potatoes and braaied ( that’s barbeque’d) vegetable skewers. I’m not sure what venison you will get there (we use Impala, Gemsbok/Oryx, Eland or Kudu), but a buck of sorts ought to cut the mustard, as it were. With the Meerlust, I think I’d avoid the pigs – bush pigs, hogs, traffic officers. The dark richness of the Venison and/or the gravy with the Beef (tempered a little by the pastry) complimented the flavours of the Meerlust admirably. The guests seemed to enjoy the combination by leaving empty plates and bottles. And all of them are still alive, which is nice. Let me know if you’d like recipes and stuff – I’ll put them up on the blog. Thanks again for the kind words, and indeed for visiting. I couldn’t agree with you more on pairing the wine with venison, in fact the last time I drank it was with my (Belgian) mom’s famous venison au chasseur, served with peppery home-made potato croquettes and it was the perfect pairing, the wine really complementing the red currant jelly in the sauce. Croquettes! Oh how I love them, piping hot or even cold the next day dipped in leftover gravy.. I love just about all venison, but my personal favourite is for gemsbok (hard to come by this side of the Atlantic), although I think kudu is unrivalled for biltong. I still have fond memories of eating a massive rare gemsbok steak with all the trimmings in Lüderitz, after spending the day wandering around the deserted streets of Kolmanskop. The meat in Namibia really is second to none, but you know this already! Here it is possible to come by (legal) venison when it’s in season, but it’s frightfully deer (oh dear). I did have the thought of perhaps making some sort of dish with breast of wood pidgeons, which are extremely common here in essex and taste superb. Another thought was my bon maman’s old flemish recipe for slow-cooked rabbit casserole cooked with prunes, but substituting some red wine for the dark Belgian ale in order to make the dish more wine-friendly. What do you think? You’ve certainly given me food for thought. I regrettably cannot boast of having tasted pigeon – wood or otherwise; nor rabbit, but I can imagine that the pigeon may pair nicely with the lighter of the reds. From what I’ve read in the recipe books, rabbit is a light meat and may therefore pair slightly better with the equivalent of a Laureat (Zonneblom) or Alto Rouge. The yin of the sweetness of the prunes and rich casserole gravy complementing the yang of the wine’s tannins…. Wow I feel so out of my depth here as even my knowledge of SA wines is still at kindergarten level compared to you guys – so please take these words with a (bit more than) pinch of salt. Re the recipes – I’ll cook up those recipes, take a pic or two and put them up on the blog asap – under the recipes menu thingy. I’m practising some dishes for a catering assignment I got today (you brought me luck old bean) for 100 people… Good to be gainfully employed for a change. I wonder if you have tried the Cape Point Vineyards Isliedh yet Gary? Love to hear your comments. For me this is one of the finest white blended wines to come out of South Africa, consistently achieving a 5/5 star ranking in Platters South African Wines. As a food match it is super versatile. Serve it salads dressed with vinaigrette; goat’s-milk cheese; lemon-garnished fish dishes and Thai food. Tomato dishes like soup, salad, pasta sauce, mutton bredie or rhogan josh curry work well as do fresh asparagus or asparagus quiche. I did, however, drink the Meerlust a week or two back and while it was good, I was a little disappointed to be honest. While I liked the savoury sour cherry flavour, it was a bit oakey for my tastes and not as elegant as I remember it to be. I guess it could really have used a few more years but I wasn’t about to wait that long! I also have a bottle of Rijks’ Private Cellar’s 2005 Shiraz which I may just crack with the same friends if the inclement British weather clears up enough for a steak braai! PS: I adore Rogan Josh and have been working on my own recipe for it over several batches for some time now. My perfect pairing? A rich, woody Chenin – like Kleine Zalze’s barrel-fermented Chenin or Ken Forrester’s FMC. As promised, the FFC blog now boasts the Venison recipe. We cooked it on Saturday as a token consolation after the Boks’ humiliating [but predictable] defeat against Kiwis. Meander over to http://ffchips.wordpress.com/2011/07/31/sensational-venison-potjie-pietried-tested-today/ at your convenience and have a squiz.